The author is editor in chief of Lawfare and a senior fellow at the Brookings Institution. If I were a senator, I would not vote to confirm Brett Kavanaugh. These are words I write with no pleasure, but with deep sadness. Unlike many people who will read them with glee—as validating preexisting political, philosophical, or jurisprudential opposition to Kavanaugh’s nomination—I have no hostility to or particular fear of conservative jurisprudence. I have a long relationship with Kavanaugh and I have always liked him. I have admired his career on the D.C. Circuit. I have spoken warmly of him. I have published him. I have vouched publicly for his character—more than once—and taken a fair bit of heat for doing so. I have also spent a substantial portion of my adult life defending the proposition that judicial nominees are entitled to a measure of decency from the Senate and that there should be norms of civility within a process that showed Kavanaugh none even before the current allegations arose. This is an article I never imagined myself writing, that I never wanted to write, that I wish I could not write. I am also keenly aware that rejecting Kavanaugh on the record currently before the Senate will set a dangerous precedent. The allegations against him remain unproven. They arose publicly late in the process and, by their nature, are not amenable to decisive factual rebuttal. It is a real possibility that Kavanaugh is telling the truth and that he has had his life turned upside down over a falsehood. Even assuming that Christine Blasey Ford’s allegations are entirely accurate, rejecting him on the current record could incentivize not merely other sexual assault victims to come forward—which would be a salutary thing—but also other late-stage allegations of a non-falsifiable nature by people who are not acting in good faith. We are on a dangerous road, and the judicial confirmation wars are going to get a lot worse for our traveling down it. Despite all of that, if I were a senator, I would vote against Kavanaugh’s confirmation. I would do it both because of Ford’s testimony and because of Kavanaugh’s. For reasons I will describe, I find her account more believable than his. I would also do it because whatever the truth of what happened in the summer of 1982, Thursday’s hearing left Kavanaugh non-viable as a justice. A few days before the hearing, I detailed in these pages the advice I would give to Kavanaugh if he asked me. He should, I argued, withdraw from consideration for elevation unless able to defend himself to a high degree of factual certainty without attacking Ford. He should remain a nominee, I argued, only if his defense would be sufficiently convincing that it would meet what we might term the “no asterisks” standard—that is, that it would plausibly convince even people who vociferously disagree with his jurisprudential views that he could serve credibly as a justice. His defense needed to make it possible for a reasonable pro-choice woman to find it a legitimate and acceptable prospect, if not an attractive or appealing one, that he might sit on a case reconsidering Roe v. Wade. Kavanaugh, needless to say, did not take my advice. He stayed in, and he delivered on Thursday, by way of defense, a howl of rage. He went on the attack, not against Ford—for that we can be grateful—but against Democrats on the Senate Judiciary Committee and beyond. His opening statement was an unprecedentedly partisan outburst of emotion from a would-be justice. I do not begrudge him the emotion, even the anger. He has been through a kind of hell that would leave any person gasping for air. But I cannot condone the partisanship—which was raw, undisguised, naked, and conspiratorial—from someone who asks for public faith as a dispassionate and impartial judicial actor. His performance was wholly inconsistent with the conduct we should expect from a member of the judiciary. When I did at least OK enough at the hearings that it looked like I might actually get confirmed, a new tactic was needed. Some of you were lying in wait and had it ready. This first allegation was held in secret for weeks by a Democratic member of this committee, and by staff. It would be needed only if you couldn’t take me out on the merits. When it was needed, this allegation was unleashed and publicly deployed over Dr. Ford’s wishes. And then—and then as no doubt was expected—if not planned—came a long series of false last-minute smears designed to scare me and drive me out of the process before any hearing occurred. Kavanaugh blew across lines which I believe a justice still needs to hold. The Brett Kavanaugh who showed up to Thursday’s hearing is a man I have never met, whom I have never even caught a glimpse of in 20 years of knowing the person who showed up to the first hearing. I dealt with Kavanaugh during the Starr investigation, which I covered for the Washington Post editorial page and about which I wrote a book. I dealt with him when he was in the White House counsel’s office and working on judicial nominations and post-September 11 legal matters. Since his confirmation to the D.C. Circuit, he has been a significant voice on a raft of issues I work on. In all of our interactions, he has been a consummate professional. The allegations against him shocked me very deeply, but not quite so deeply as did his presentation. It was not just an angry and aggressive version of the person I have known. It seemed like a different person altogether. My cognitive dissonance at Kavanaugh’s performance Thursday is not important. What is important is the dissonance between the Kavanaugh of Thursday’s hearing and the judicial function. Can anyone seriously entertain the notion that a reasonable pro-choice woman would feel like her position could get a fair shake before a Justice Kavanaugh? Can anyone seriously entertain the notion that a reasonable Democrat, or a reasonable liberal of any kind, would after that performance consider him a fair arbiter in, say, a case about partisan gerrymandering, voter identification, or anything else with a strong partisan valence? Quite apart from the merits of Ford’s allegations against him, Kavanaugh’s display on Thursday—if I were a senator voting on confirmation—would preclude my support. Perhaps if I believed Kavanaugh’s testimony in its totality, if I believed his denial—and thus his anger—to be entirely righteous, I could see fit to look past the impropriety of his performance. 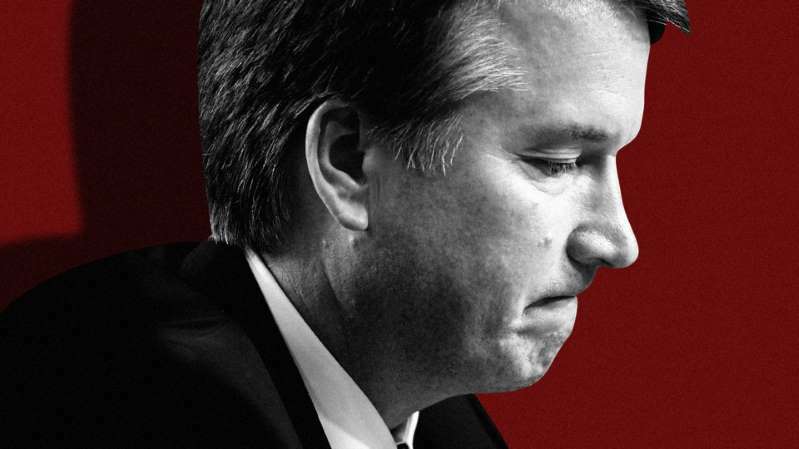 If Kavanaugh is, in fact, wholly innocent, after all, what has happened to him is so monstrous that perhaps we might forgive him the excess in view of the pressures he is under and the wrongs he would clearly have suffered—though the outburst was part of his prepared statement and thus should be seen as his considered decision about what he wanted to say. I fear the evidence is not, however, quite in equipoise, even if one believes that a senator should confirm a justice on the basis that the presumption of innocence should break the tie between two equally compelling testimonies. At least as I read it, though it pains me to say so, the evidence before us leans towards Ford. Let’s consider the balance sheet carefully. On one side of the ledger, Ford is wholly credible. Yes, her story has holes. The location of the event is unclear in her memory, as is—importantly—how she got home and what happened after she left the house in question. Yet few observers seem to dispute her credibility. Not even Kavanaugh and his supporters contend that she is lying or making up the incident in question, merely that she is mistaken as to his involvement in it. Her story is certainly plausible and certain details she offers lends it additional credibility. She correctly identifies, for example, a social circle that appears actually to have existed around Kavanaugh during the summer in question. A fabulist likely would not know, for example, of Kavanaugh’s friendship with Mark Judge and their propensity to drink beer together in the relevant period with other individuals she named. While Kavanaugh said he didn’t recall meeting Ford but that it was possible they had interacted, it seems overwhelmingly likely that her claim to have known him and his circle socially while the two were in high school is true. While Ford can offer no contemporaneous corroboration of story in the form of testimony from people who remember being present at the alleged event, her story is not wholly uncorroborated either. She appears to have told her therapist about the alleged event years ago, and she identified Kavanaugh as her attacker to her husband years ago as well. She initially raised the allegation with her congresswoman before Kavanaugh’s nomination took place. At a minimum, it seems quite clear that Ford was genuinely part of the world in which she claims the attack took place and that she genuinely believed—long before Trump’s election, let alone Kavanaugh’s nomination—that Kavanaugh attacked her. That she believes this story sincerely is corroborated, if only weakly, by her polygraph exam. Polygraphs are not especially reliable, but the willingness to take one can be a show of strength in a witness. The polygraph is not evidence that Kavanaugh attacked Ford. It is evidence that Ford believes her story truthful and is an earnest accuser, not a conspirator. Her story is also corroborated, imperfectly but perceptibly, by Kavanaugh’s high school calendar. Ford describes the attack as taking place at a gathering at which at least four boys—Kavanaugh, Judge, Patrick (P.J.) Smythe, and a boy whose name Ford could not remember—and one girl, Leland Keyser, were drinking beer. Ford specifically allowed for the possibility that there might have been others present as well. Kavanaugh’s calendar entry for the evening of July 1, 1982, contains an entry that reads, “Go to Timmy’s for skis with Judge, Tom, P.J., Bernie and Squi.” In the hearing, Kavanaugh acknowledged that “skis” in this entry referred to “brewskis,” or beer; that P.J. was Smythe; that Judge was Mark Judge; and that “Squi” was a boy who, Ford had earlier testified, just happened to have been someone she “went out with” for a short time. The calendar entry does not include Ford or Keyser, so the corroboration is far from perfect. It also includes people not mentioned by Ford. Then again, the degree of overlap with Ford’s story is striking. In the summer in which Ford alleges that Kavanaugh attacked her at an evening get-together with a small group of boys drinking beers, his calendar identifies an evening get-together with a small group of boys drinking beers, including three of the boys named by Ford, along with one she dated. Why exactly Kavanaugh imagines his calendar entries to be powerfully exculpatory I am really not sure. Ford’s story also finds some degree of corroboration in Mark Judge’s employment history. Ford claims that she saw Judge some weeks after the alleged attack at the Safeway where he worked and that he was visible uncomfortable seeing her. The Washington Post verified from Judge’s own memoir that he was, in fact, working at a grocery story as a bagger in the relevant period. Assuming the FBI investigation firms that up, it would offer another data point tending to corroborate her account’s consistency with verifiable facts. On the other side of the ledger is Kavanaugh’s testimony, and here we cannot be quite so confident that the witness was being candid. Kavanaugh’s testimony, whatever one makes of his impassioned claims of innocence on the specific charge, is not credible on the more general issue of his drinking habits. It is, as Kavanaugh suggested at the hearing, absurd for senators to argue with a Supreme Court nominee over his high school yearbook. Then again, Kavanaugh’s unwillingness to acknowledge the obvious—that his yearbook described a hard-drinking culture that he was a part of and that make Ford’s account more plausible—made it necessary to do so. Kavanaugh would not concede that the phrase “Beach Week Ralph Club — Biggest Contributor,” referred to drinking culture, claiming it was simply a reference to his having a weak stomach. He ascribed implausibly innocent definitions to other terms that appeared in the yearbook. He diminished the casual cruelty he and his friends showed to one girl, Renate Schroeder Dolphin, by describing themselves as “Renate Alumni.” He claimed they intended to show her respect and friendship, but that is not how she reads it three-and-a-half decades later. She told The New York Times, “the insinuation is horrible, hurtful and simply untrue. I pray their daughters are never treated this way.” She is not a fool. His repeated suggestion at the hearing that he had never been so drunk as to have any possibility of memory loss flies in the face of the memories of a number of classmates from college. My point is not that his confirmation in any sense turns on how much Kavanaugh drank or whether he and his friends made misogynistic jokes as teenagers. But his testimony doesn’t have the ring of truth either. And lack of candor in a witness in one area raises questions about the integrity of that witness’s testimony in other areas. Several days later, bin Laden summoned Al-Adahi for another meeting. According to Al-Adahi, at his meeting bin Laden asked him about people he was connected with in Yemen—some of whom were involved in jihad …. In the habeas proceedings, Al-Adahi tried to explain his personal audience with bin Laden on the basis that “meeting with Bin Laden was common for visitors to Kandar.” This is, as the government points out, utterly implausible …. [Yet] the district court said nothing, despite the well-settled principle that false exculpatory statements are evidence—often strong evidence—of guilt. The opinion was not written by Kavanaugh, but Kavanaugh was on the unanimous panel that decided the Al-Adahi case. There’s another factor that weighs in Ford’s favor: the failure of the committee to meaningfully engage Mark Judge. The current FBI investigation should ameliorate this problem, and it’s possible, I suppose, that Judge could change the picture significantly in Kavanaugh’s favor—if, for example, he informs the FBI that Kavanaugh was never out-of-control drunk with him or if he denies ever working at the Safeway. The committee’s contentment with the perfunctory letter he sent, however, has the air of fear—fear of what Judge would say. This unwillingness to ask Judge obvious questions erodes Kavanaugh’s position. To be clear, I am emphatically not saying that Kavanaugh did what Ford says he did. The evidence is not within 100 yards of adequate to convict him. But whether he did it is not the question at hand. The question at hand is how a reasonable senator should construct the evidence to guide a binary vote for or against elevation of a judge to a lifetime appointment to the highest court in the land. By my read, we have two witnesses who both profess 100 percent certainty of their positions—one whose testimony is wholly credible and marginally corroborated in a number of respects and the other whose testimony is not credible on a number of important atmospheric points surrounding the alleged event. It’s not a tie, and it doesn’t go to the nominee. There’s one more reason I could not vote to confirm Kavanaugh: his apparent lack of candor on the culture of drinking at Georgetown Prep and later is a problem of its own, quite apart from what it may indicate about the truth of Ford’s story. People throw around words like perjury too blithely. I won’t do so here. I will say that I do not believe he showed the sort of candor that warrants the Senate’s—or the public’s—confidence. To the extent some commentators on the right are defending Kavanaugh’s testimony as containing the sort of white lies that anyone might tell under the circumstances, let me just say that I don’t believe that Supreme Court justices get to tell self-exculpating white lies—and I don’t believe in white lies from anyone else either in sworn congressional testimony. Over the weekend, I listened to a number of podcasts in which liberals mocked Kavanaugh as an entitled white male refusing to face accountability for what he had done. I find the tone of these discussions nauseating—undetained by the possibility of error. I, like Flake, am haunted by doubt, by the certainty of uncertainty and the consequent possibility of injustice. I spent a lot of time this weekend thinking about Oliver Cromwell’s famous letter to the Church of Scotland in which he implored, “I beseech you, in the bowels of Christ, think it possible you may be mistaken.” I also spent some time with Learned Hand’s similar maxim, “The spirit of liberty is the spirit which is not too sure that it is right.” We all need to think it possible that we may be mistaken; we all need to be not too sure that we are right. But my bottom line is the opposite of the one Flake expressed in his statement: faced with credible allegations of serious misconduct against him, Kavanaugh behaved in a fashion unacceptable in a justice; it seems preponderantly likely he was not candid with the Senate Judiciary Committee on important matters; and the risk of Ford’s allegations being closer to the truth than his denial of it is simply too high to place him on the Supreme Court. We are in a political environment in which there are no rules, no norms anymore to violate. There is only power, and the individual judgments of individual senators—facing whatever political pressures they face, calculating political gain however they do it, and consulting their consciences to the extent they have them. As much as I admire Kavanaugh, my conscience would not permit me to vote for him.